At long last, I'm pleased to announce the second book in the Jason Van Otterloo Trilogy is available for pre-order on Amazon. 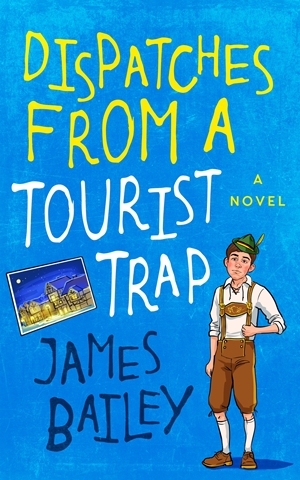 It's called Dispatches from a Tourist Trap and will release in Kindle format officially next Tuesday. Thanks to his parents' separation, Jason Van Otterloo is starting his sophomore year of high school three hours away from all his friends--including his new girlfriend, Sian. Tiny Icicle Flats is a quaint Bavarian-themed mountain village that has been trapped in time since long before his mother grew up there. That she was willing to return is all down to her new boyfriend--who also happens to be her new boss. And judging by all the makeup found in his bathroom cabinet, Jason's dad isn't wasting time waiting for her to return. Jason begins a blog to share details of his new life with his old friends, but some news isn't meant for wide distribution. Fortunately, his sage-but-sarcastic best friend, Drew, is always just an email away. Would it be so wrong, Jason wonders, to ask a local girl named Leah to the Homecoming dance? "Just as a one-time date, nothing more, obviously." "Why are you asking me and not Sian?" Drew replies. "Wait, I think I know the answer." If only Jason would ever take his friend's advice, he might spend less time climbing out of the holes he digs for himself. Pressed into afternoon and weekend duty at his grandpa's hardware store, Jason still finds time to join an after-school book club that specializes in controversial classics. When Leah's brother reports the book club to the school board, Jason and his fellow readers are forced underground--until they emerge again to enter a protest float in the Icicle Flats Christmas parade. The ensuing brouhaha makes for the most exciting holiday season Jason can remember. And for once, it's not his parents' arguing that takes center stage. With the new year comes a new scheme: If the local busybody brigade was upset by a few old books, pirate radio will surely blow their minds. Who ever said life in a small novelty town would be dull? Told entirely through Jason's email exchanges and blog posts, Dispatches from a Tourist Trap picks up where The First World Problems of Jason Van Otterloo left off. Come and spend a little time in Icicle Flats--just don't forget to pack your lederhosen. Well, there it is. Order your copy today for just $2.99. Or read it free if you're a Kindle Unlimited subscriber. And tell all your friends. Thanks! Print is undead, long live print!